Travel back in time to the early days of St. Augustine! Colonial Quarter in St. Augustine, FL, is one of the best living history museums in town. With demonstrations with replica weapons to fantastic onsite restaurants, it’s easy to spend a full day here. Discover everything you need to know before visiting Colonial Quarter! 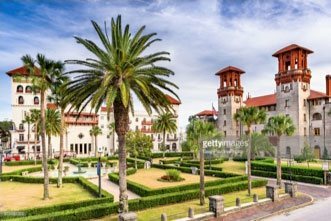 Are you looking for more great attractions like Colonial Quarter in St. Augustine, FL? Access our free Vacation Guide! Inside, you’ll find all the best historic sites, museums, and interesting and unique spots in town. Plan your getaway to the Nation’s Oldest City in no time when you use our free Vacation Guide! Colonial Quarter is just one block away from Agustin Inn and is situated on the famous St. George Street in St. Augustine. Tickets are $23.98 for adults (ages 13 and over) and $5.98 for children (ages five to 12). Guests can choose to take the self-guided tour to experience the attraction or take one of the guided tours, which are available at 10:30 a.m., noon, 1:30, and 3:00 p.m. On the tour, you’ll see live historic demonstrations of how citizens of colonial St. Augustine spent their time. One of the most popular activities in the park is the live musket demonstration. You will be able to learn first-hand how to lock, load, and fire a replica of a 17-century musket. The blacksmith’s shop is another popular stop on the route. Learn how blacksmiths once reworked old metal into new tools, nails, or cooking equipment. If you’re up for a climb, head to the top of the replica Spanish watchtower for a fantastic view of the Castillo de San Marcos National Monument and the bayfront. There’s nothing quite like a bird’s eye view of this gorgeous city! If you’d prefer to have a flatter walk, head to Flags over St. Augustine boardwalk, which features the many flags that have flown over this city during its 450-year history. 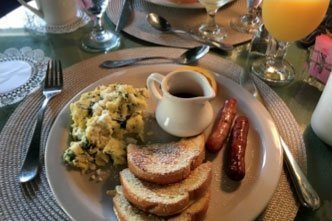 There are three excellent places to eat at Colonial Quarter, each representing a different facet of St. Augustine, Florida. Bull & Crown is styled after a British pub, calling back to the days of English control of the colony. This eatery is serving up burgers, fish and chips, and delicious chicken wings, as well as craft cocktails and beer. Taberna del Caballo is a Spanish-style tavern, with tapas, sangria, and live music. This restaurant represents when Spain ruled over St. Augustine. Finally, St. Augustine Seafood Company is the newest addition to the lineup. It showcases modern St. Augustine cuisine, with heaps of delicious and fresh seafood prepared to perfection. 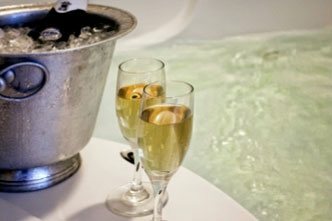 After you’ve visited Colonial Quarter in St. Augustine, FL, return to Agustin Inn for a relaxing night! We are centrally located in the historic district of St. Augustine, just off of St. George Street. 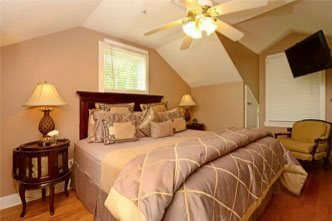 Our gorgeous bed and breakfast is just a short walk away from some of the best restaurants, bars, shops, museums, and more! Arrange your trip to St. Augustine in no time at all when you take advantage of our add-on attractions. When you book a room with Agustin Inn, you can also book a ticket to the Old Town Trolley Historic Tour, a private horse and carriage tour, a sightseeing cruise, and more! 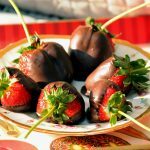 If you’re planning a romantic getaway, consider adding one-dozen mixed roses or chocolate-covered strawberries to your reservation. These items will be waiting for you in your room, impressing your loved one!